Adult apterae of Pemphigus trehernei on the roots of sea aster, its secondary host, are yellowish white to greenish white (see first picture below). They are covered with greyish white wax which forms tufts on the abdomen, and also coats the roots upon which they feed (see second picture below). Characteristics which separate the 'bursarius' group of species (which includes Pemphigus trehernei) from other Pemphigus species, are: (a) the subgenital plate has a total of 13-16 hairs and (b) the last antennal segment (including the terminal process) is 0.89-1.24 times longer than the second hind tarsal segment. There are no morphological characters that can be used to differentiate apterae of Pemphigus species within the 'bursarius' group such as Pemphigus phenax, Pemphigus gairi, and Pemphigus bursarius. The body length of the adult Pemphigus trehernei aptera is 1.3-2.4 mm. 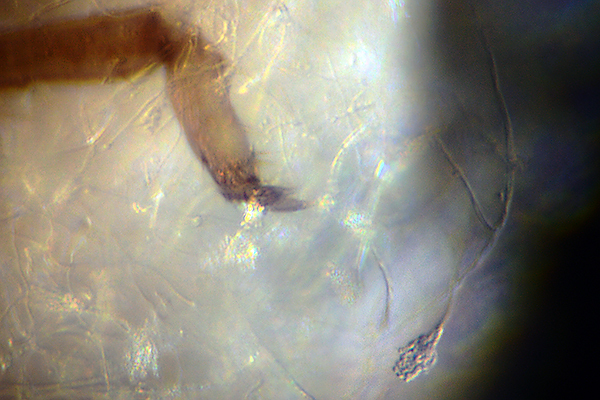 The emigrant alate of Pemphigus trehernei from poplar (obtained by experimental transfer) has antennal segment III 0.30-0.40 times the length of the hind tibia. Secondary rhinaria are distributed 11-19 on antennal segment III, 4-8 on segment IV, 4-10 on segment V and 6-11 on segment VI. Pemphigus trehernei has only been found naturally on its secondary host, sea aster (Tripolium pannonicum). 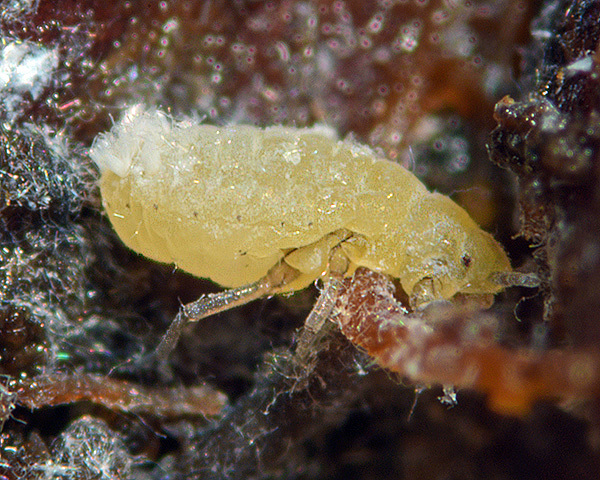 Aphid populations are largely confined to the edges of creeks and saltpans. Alate sexuparae are produced in September to December but overwintering of parthenogenetic generations on the roots of Aster tripolium is common. Alate sexuparae of Pemphigus trehernei have been transferred experimentally to lombardy poplar (Populus nigra var. italica), and subsequent generations produced globular green galls with a reddish tinge around the exit hole. Pemphigus trehernei has only been recorded from England, Ireland and France. We have only found Pemphigus trehernei on one occasion - in October 2018 at Keyhaven saltmarsh on the Hampshire coast in the south of England. 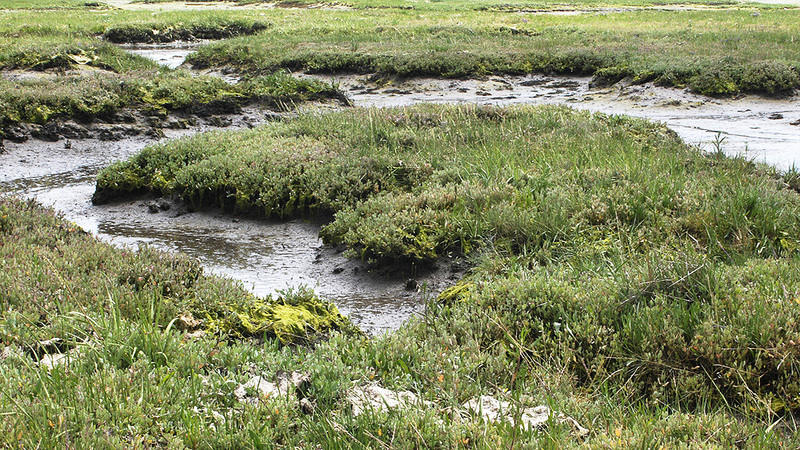 The marsh surface at Keyhaven can be divided into two ecozones: the low (or submergence) marsh and the high (or emergence) marsh, depending on its exposure to the marine versus terrestrial environment. On submergence marsh, salinity approximates to that of the sea water which bathes it, but on emergence marsh, considerable variations in salinity occur as a result of evaporation and the input of rain and freshwater. 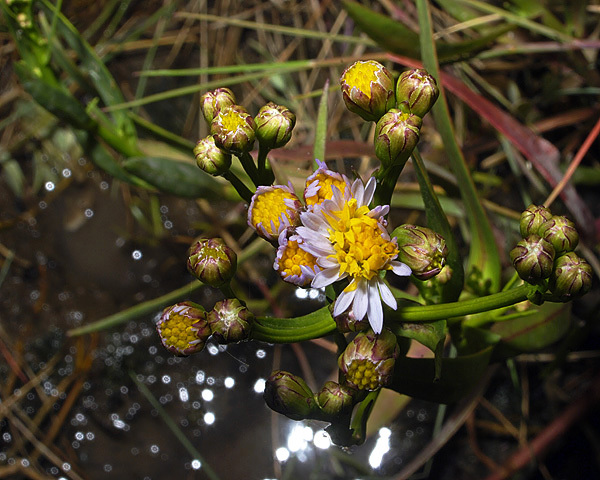 The host of Pemphigus trehernei, the sea aster (Tripolium pannonicum), is mainly found in submergence marsh. Many saltmarsh insects avoid submergence, for example by flight, climbing, or movement on the surface film. But some of the saltmarsh insect fauna is relatively immobile, for example apterous aphids and coccids, and immature stages of Diptera and Lepidoptera. Such insects are inevitably submerged by high tides. Some aphids such as the sea lavender aphid (Staticobium staticis) feed on the upper parts of the host plant which are only submerged for relatively brief periods. Pemphigus trehernei feeds on the roots (see picture below) and so experiences much longer periods of submergence. Foster and Treherne (1976) carried out a series of experiments on the effects of tidal submergence on Pemphigus trehernei. Survival of adult Pemphigus trehernei in well aerated sea water was found to be near 100% after 80 hours, only dropping to 50% after 210-230 hours submergence. In contrast, survival of the shoot-feeding Staticobium staticis was only 50% after 12-20 hours submergence. Survival of Pemphigus trehernei was only good in well aerated water. In oxygen deficient sea water, Pemphigus trehernei began to die rapidly after 30 hours, and all were dead after 44 hours. It has been found that Pemphigus trehernei is largely restricted to edge regions in submergence marsh. It is proposed that the sustained deterioration in soil aeration in non-edge marsh soil is the primary factor in restricting the aphid to well-drained edge regions. The precise way in which Pemphigus trehernei survives submergence is unclear. During tidal submergence, air is usually trapped within the surface layers of the marsh soil, and it is generally assumed that soil insects are not directly exposed to sea water. 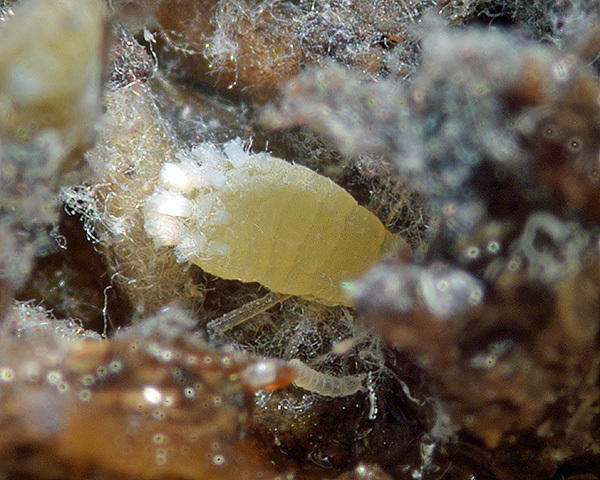 Instead the waxing of the soil cavities inhabited by the aphid Pemphigus trehernei (and Aploneura lentisci) confers waterproofing properties. In addition Foster & Treherne also postulated that air stores trapped between the appendages and the abdominal wax tufts and the thin layers of air which cover the abdomen could function as a physical gill during submergence. The sea aster root aphid shows a marked reduction in the importance of flight in dispersal as compared with its terrestrial relatives, such as the lettuce root aphid Pemphigus bursarius, and alates of Pemphigus trehernei are scarce. Instead the main mechanism is tidal dispersion of first instar larvae. Foster, 1974 & Foster & Treherne, 1978a,b carried out detailed studies of the dispersal of Pemphigus trehernei. Newly born first instar aphids were found to differ from all subsequent stages in moving towards light. The first instar larvae crawl to the surface and are taken up by the flooding tide. Due to their waxy covering they float proud of the surface and are virtually unwettable. The floating aphids are sensitive to wind movements and are propelled rapidly across the surface of the sea. Experiments with model aphids (small polystyrene balls) indicated that the tide is a very effective means of dispersing floating objects from restricted sources over a wide area of marsh. There was usually a period of tide-influenced movement followed by a period of wind-influenced movement as the tide flooded the marsh. It was also observed that a significant proportion of the floating models were deposited in edge situations on the marsh. The positive response of first instar Pemphigus trehernei to light was rapidly reversed by a short period of floating on sea water, and the first instars colonize the sea aster roots. Chloropid fly larvae (Thaumatomyia spp. 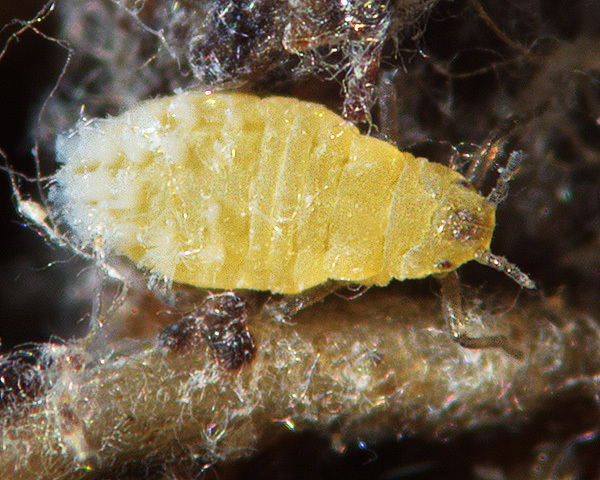 ), are usually found with terrestrial Pemphigus root colonies, but are absent from colonies of the aphid Pemphigus trehernei. This suggests that they are unable to maintain themselves in the intertidal zone. However, a wide variety of predators and parasites of insects have been recorded from marine saltmarshes. Birds are the most important vertebrate predators of aphids on saltmarshes. Many species are found there, for example ringed plovers (Charadrius hiaticula) and dunlin (Calidris alpina) have been recorded feeding on saltmarsh insects (Green, 1954). 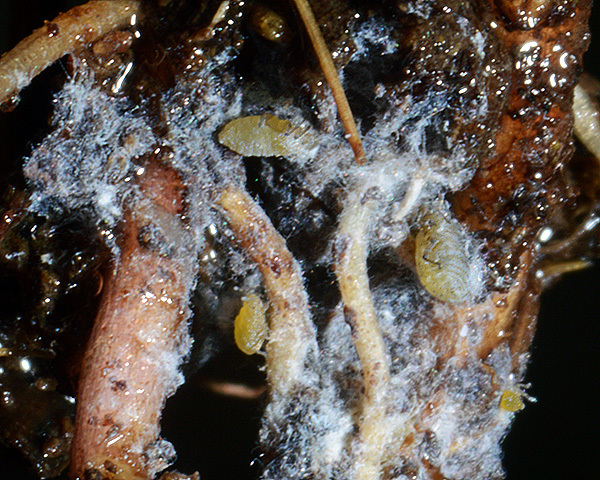 Root colonies of the aphid Pemphigus trehernei, which lives in aerobic conditions, are subject to attack by the hyphomycete fungus Metarrhizium anisopliae. Fungal attack is most severe during summer and autumn, and is probably an important factor influencing the aphid's abundance (Foster, 1975). 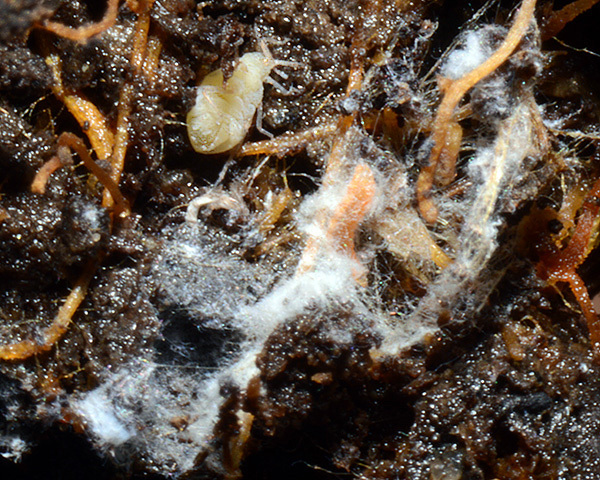 This widespread fungus has not previously been reported from any terrestrial aphid species, perhaps suggesting that the conditions in the submergence marsh soil (e.g. the permanently high humidity) favour sporulation and germination of this type of entomogenous fungus. We found a few Pemphigus trehernei aptera, among the sea aster roots, shrouded in hyphae - but we have not confirmed this is Metarrhizium anisopliae. 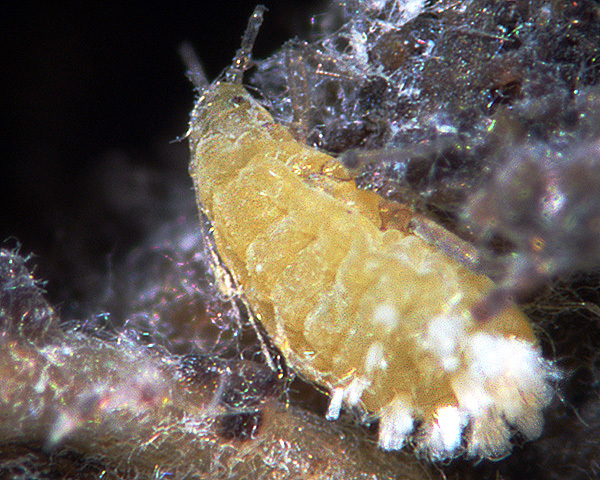 The first micrograph below shows a Pemphigus trehernei aptera, in alcohol, shrouded with fungal hyphae. 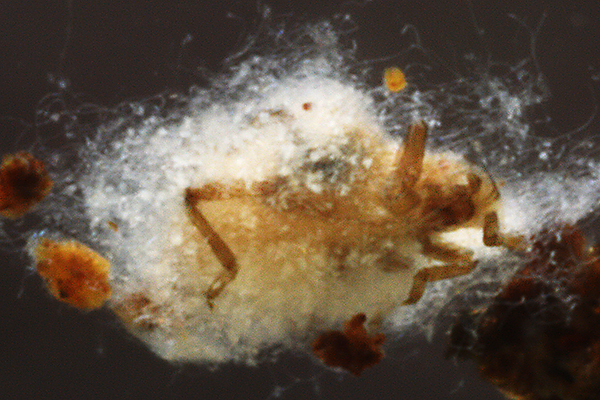 The second is a close-up showing a tarsus with fungus fruiting-body (bottom right). Pemphigus trehernei has never been recorded from its primary host, presumed to be Populus nigra. Exclunding one unidentified Pempigus sp. from Kazakhstan, and a Stomaphis sp. nr graffii, Blackman & Eastop list 41 species of aphid as feeding on black, or Lombardy poplar (Populus nigra) worldwide, and provide formal identification keys. Pemphigus trehernei has been recorded from Tripolium pannonicum, and possibly Solidago virgaurea. Blackman & Eastop list 6 species of aphid as feeding on sea aster (Tripolium pannonicum) worldwide, and provide formal identification keys. Of those aphid species, Baker (2015) lists all 6 as occurring in Britain: Aphis fabae, Aphis tripolii, Brachycaudus helichrysi, Macrosiphoniella asteris, Myzus persicae and Pemphigus trehernei. Foster, W.A. (1974) The biology of a salt marsh aphid (Pemphigus sp.). Ph.D. Thesis, University of Cambridge, U.K.
Green, J. (1954). The food, predators and a parasite of Bembidion laterale (Samouelle) (Col., Carabidae). Entomologists Monthly Magazine 90, 226-227.